BlackBerry today filed a second lawsuit against Typo Products, the startup backed by Ryan Seacrest, alleging that the second-generation Typo keyboard continues to infringe upon its intellectual property, reports The Hollywood Reporter. In a complaint lodged in a California federal court on Monday, BlackBerry claimed Typo "slavishly copied" its keyboards down to the "smallest detail." Just as they did with the Typo Keyboard, Defendants have again copied numerous proprietary BlackBerry designs and patents in the Typo2 Keyboard. The Typo2 Keyboard still blatantly copies BlackBerry's iconic keyboard trade dress designs that have been embodied in numerous BlackBerry smartphones from the 2007 BlackBerry 8800 to the current Q10 and Classic models. The Typo2 Keyboard also infringes numerous BlackBerry utility patents related to BlackBerry's proprietary keyboard design, backlighting and typing automation technologies. 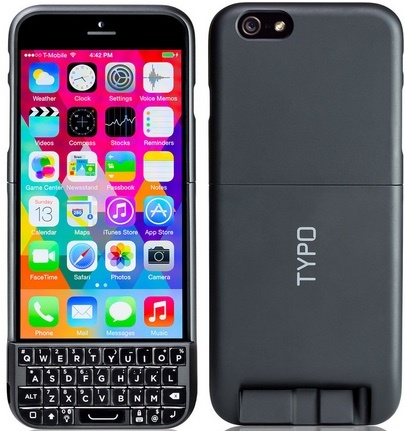 Typo Products first clashed with BlackBerry shortly after the former debuted its first-generation Typo iPhone keyboard case in late 2013. Backed by media personality Ryan Seacrest, the product was the result of a desire to create a physical keyboard for the iPhone after he and his partner Lauren Hallier saw many of their friends carrying two phones -- one for typing and correspondence, presumably a BlackBerry, and an iPhone for everything else. The snap-on iPhone keyboard that Seacrest and Hallier developed looked very similar to a BlackBerry keyboard, which BlackBerry took offense to. BlackBerry sued and won an injunction against Typo Products, leading Typo to produce the Typo2, a second-generation keyboard that it claimed did not violate any BlackBerry patents. The $99 Typo2 features a sleeker design with a built-in keyboard that unfortunately blocks the Touch ID fingerprint sensor on the iPhone 6. Though Typo Products claims that its second-generation offering does not infringe on BlackBerry patents, it continues to bear a visual resemblance to the keyboards BlackBerry has used in its products for years. According to BlackBerry, with the Typo2, Typo Products produced a "minimally modified derivative version" of the original Typo keyboard that continues to abuse BlackBerry's trade dress. The lawsuit cites a range of media reviews that compare the Typo2 to the BlackBerry, pointing out the marked similarities between the two, including a comment from one of our own forum members. BlackBerry's lawsuit also accuses the Typo2 of infringing on five BlackBerry patents. BlackBerry now has two lawsuits pending against Typo, for the original Typo keyboard and the Typo2. BlackBerry has also won an award of $860,000 after Typo continued selling its original keyboard in violation of the previously mentioned injunction. In the newest lawsuit, BlackBerry asks for "enhanced and exemplary" damages for Typo's continued infringement. Great move Blackberry! I bet this lawsuit will go down as the thing that sparked their big comeback! I HATE patents. End them. End them ALL. If you would understand the true purpose of a patent, or had at any time in your life invested money and time to develop a product and bring it to market, then you wouldn't have made such a dumb comment. Why anybody would buy a Blackberry, let alone a Blackberry keyboard for your iPhone, is beyond me. Looks like they're only trying to protect their IP, though I'm not sure legally what chance they actually have. They should still go for it as it's their intellectual property. Just because there's the chance they might lose in court doesn't mean they shouldn't defend what's rightfully theirs. Unlike some other companies, BlackBerry is still actually using its patents in current products ever since the original "BlueBerry" models. I think its hilarious that Blackberry is wasting their time trying to kill a product that will die on its own. Hey Man! R & D isn't free. The courts recognize that. Hence the Patent and Copyright provisions. If someone blatantly copies your work, then you have the right to seek redress. Intellectual property must be respected or Innovation dies. Not sure on the Typo2, but on the Typo 1, they've won outright. Will be interesting to see if the judge thinks the Typo2 is differentiated enough or not. Problem is Typo is fighting an uphill battle. The Typo case was clearly identified and found to violate patents and trade dress. They were given a court imposed injunction and still refused to stop selling the Typo case. hence the 860,000 penalty awarded to BBRY already. That sort of "mockery" of a court decision tends to show very unfavourably towards future considerations should the same general court case have to continue.